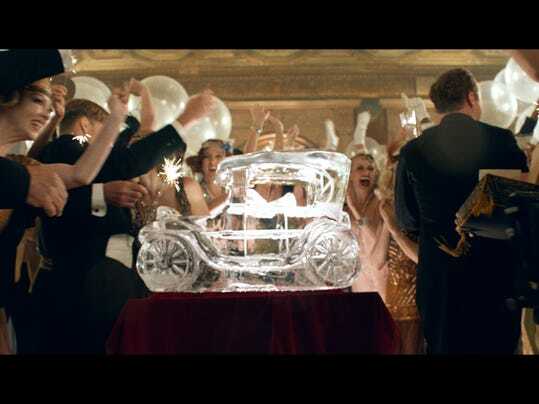 Image attached: A still from the “Ballroom – They Dreamed Big” spot that kicked off Dodge’s new advertising campaign that takes place 100 years ago after John and Horace Dodge created the Dodge Brothers Motor Car Co. Dodge is mixing legend with history and horsepower for its new national ad campaign. The campaign, which launched Saturday with the first of a series of television spots, takes place 100 years ago after John and Horace Dodge created the Dodge Brothers Motor Car Co. It imagines the brothers’ elaborate lifestyles and how they would be proud of the 2015 Dodge muscle cars. The first ad, called “Ballroom — They Dreamed Big,” is set during a ballroom party for the brothers that features over-the-top decorations and celebration. During the festivities, the voiceover tells the imaginary tales of the brothers. Chrysler Chief Marketing Officer Olivier Francois said the campaign is meant to pay homage to the brothers that led the brand to what it is today. “Ballroom” is the first national ad exclusively for the Challenger since a 2010 Super Bowl commercial called “Freedom.” It featured Revolutionary War fighters in battle, followed by George Washington and his men driving up in muscle cars to save the day. The new Dodge ad campaign includes full-page and spread print ads. The first ads show the 2015 Dodge Challenger with the headline, “They may be gone, but they left us the keys.” The ads will run in enthusiast, lifestyle and general market magazines and newspapers. More television and print advertising featuring the Dodge brothers for the 2015 Dodge Charger and high-performance Hellcat SRT and Viper models are expected to follow in the coming months. “Ballroom” can be viewed on Dodge’s YouTube channel, youtube.com/dodge.